Norwalk Chief of Operations and Public Works Anthony Robert Carr emphasizes Tuesday that a look at the “overall picture” is needed when dealing with flooding issues, at the Common Council Public Works Committee meeting in City Hall. NORWALK, Conn. – Flood-stricken Norwalk residents were assured Tuesday that their voices are being heard and that work is under way to assess and address their problems. “Sometimes there is very little that can be done but we need a consultant to tell us that,” new Chief of Operations and Public Works Anthony Robert Carr said to concerned citizens at the Common Council Public Works Committee meeting. Carr, Council members and DPW Principal Engineer Lisa Burns stressed that a comprehensive study is being done, and City administration is open to increasing the capital budget to address flooding concerns. Two lifelong Norwalkers, Matt Scully and Anthony Tomosino, said they were considering leaving because of water difficulties. They never had flooding until four years ago, they said. Scully and Tomosino noted that an Andrews Field culvert nearby appears to be clogged. A Sept. 25 storm sent 105 million gallons of stormwater through a system built to handle 90 million gallons a day, Public Works Committee Chairman John Igneri (D-District E) said in October. Angelo DiPasquale, who lives on the notoriously flood-prone Saddle Road, said he’s been talking to City officials about the problems for eight years. “I am not talking about just mold I am talking about sewage and it’s not just directly in front of my house. When it floods, my house becomes an island. So you’re talking about the full 360 on my property,” DiPasquale said. Council members in 2015 allocated money for a diversion effort, and then authorized more money in the following year, but that “a marginal fix to begin,” Senior Civil Engineer Paul Sotnik said in October. Sotnik described that work as a $300,000 band-aid. Saddle Road residents met with Rilling in November and were promised updates and information, DiPasquale told NancyOnNorwalk. “Here we are in April, we haven’t had a meeting since,” he said. 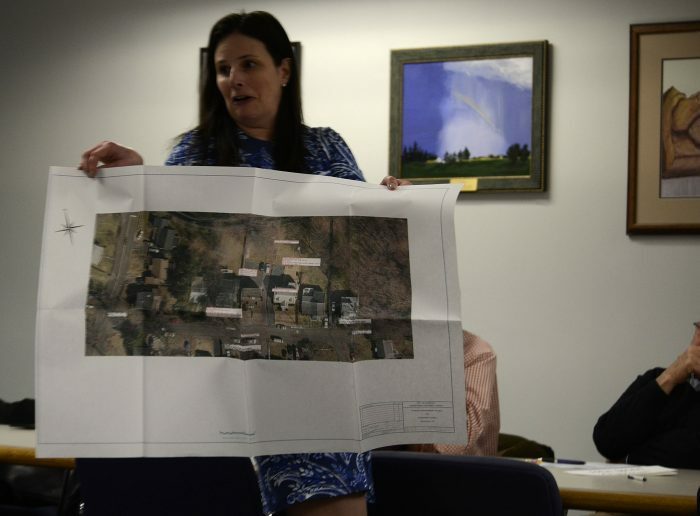 Norwalk DPW Principal Engineer Lisa Burns shows citizens attending the Council Public Works Committee meeting an analysis done of a flood-prone area, Tuesday in City Hall. Effective, long-term fixes were a theme. Burns said a consultant had been hired in December and reviewed a study done by Milone and McBroom, which Carr referred to as being useful and informative but seven years old and in need of an update. “I agree that this analysis has to be looked at holistically. You don’t want to look at drainage issues in a silo because it’s almost like whack-a-mole,” Carr said, warning that sometimes solving one problem creates another elsewhere. Carr started work three weeks ago and dealt with similar problems in his previous job in Mamaroneck, he said. The Council in November appropriated $1 million, at Rilling’s request, to begin working on flooding issues. “Jacobs” was hired as a consultant, according to Burns, and now a another consultant may be hired to work in tandem, DPW Superintendent of Operations Chris Torre said. Within the next few weeks a consultant will be selected, and will begin work by meeting with City staff and later hold a public workshop to gather information from residents, Carr said. There’s a “high level of commitment from everyone involved,” Health, Welfare and Public Safety Committee Chairman Nick Sacchinelli (D-At Large) said. 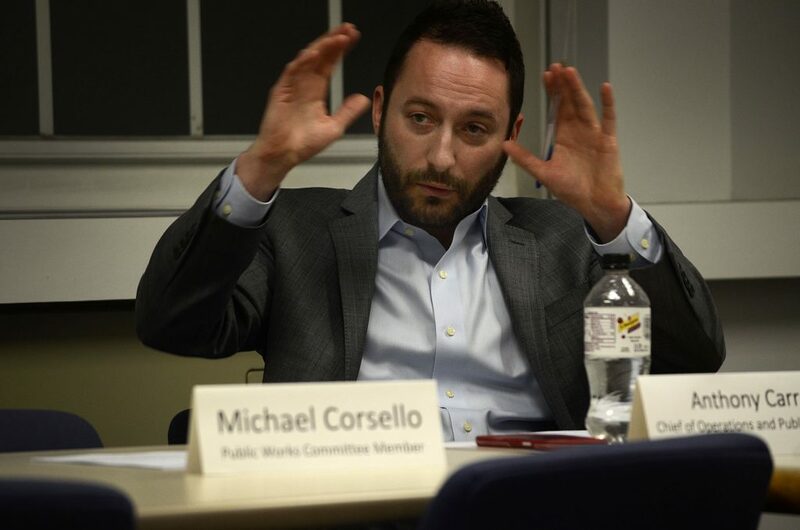 Last week, Sacchinelli talked of declaring the flooding a health crisis. On Tuesday, he asked Torre to explain the signage he’d mentioned in connection to that. Sensors would be installed in flood-prone road locations, triggering flashing lights when there’s a problem, Torre said. DPW is going to work on the County Street culvert Wednesday and there will be improvement, Carr said, warning that he’d be lying if he promised the problems will be solved. DiPasquale told NancyOnNorwalk afterwards that he appreciated the sentiments expressed, but wanted more communication. “If you are left in the clouds, you don’t know what’s going on, you’re left in limbo,” he said. Waste more money on a study to find out we just aren’t sweeping the streets and cleaning the drains like we used to. It takes a while, but we are witnessing the compounding effect of neglected duties for several years. It’s not the rank and file causing this, but the knee jerk decisions from above that squander resources by improperly allocating them. Recall the paving work done over the summer and the streets that were half paved with equipment parked on them for several weeks only to have the equipment move off to other “more pressing” jobs. Any contractor will tell you that mobilization is 10% of the job and very expensive. When City Hall is pushing buttons to get political favors done instead of letting the crews work in a systematic, street by street, neighborhood by neighborhood fashion this is what happens. It’s nor rocket science. Save the money and put it into overtime, if that’s what it takes. After spending $75k to study the weeks on Manresa Island why not “study flooding”. Water St. Is aptly named. Been flooding for many decades. Projections for rising LI waters suggest our shabby Downtown will be subject to very serious flooding. City Hall “working on it’ ? Stamford has long had flood gates that have prevented major flooding. Maybe City Hall could learn from Stamford. You just can’t make this stuff up. Only on Planet Norwalk. Look at how many times “study” and “consultant” are mentioned! It’s insanity. Norwalk does a fantastic job of studying the problem, hiring someone to do a study, then studying the study to see if the study should go on the lower shelf or top shelf to gather dust. I live on Muriel and pass through Saddle/Friendly/Mark Dr. frequently. Wasn’t that area in question torn up for weeks in 2018? I’m no engineer but it was no exactly down spouts, garden hose and 2 shovels parked there – it was huge pipes, concrete forms and massive construction equipment. Then….I Googled this gem ABOUT THE SAME PROBLEM….in 2012!!!! What a sewer show. 2012….7 years later and it’s time to fire up another study. Sufficient money to start executing a 7 part plan was put in place under Hal Alvord, who had created the plan with an outside engineering firm. Mayor Rilling fired him. The next few years were relatively dry, and nothing proceed. They also started regular maintenance of storm drains and ponds under Hal. If mayor Rilling allowed that to stop, he should be removed from office. Dave McCarthy is up at 4 am in Florida still spreading misinformation in his old hometown of Norwalk, just like the old days. Strange how nostalgia works. The inconvenient truth for McCarthy is that Harry Rilling has invested millions in fixing drainage problems, he’s expanded the cleaning of drains and pipe maintenance, and he and DPW are doing the best they can keeping up with intense storms that are coming more frequently than ever now with climate change., which by the way Dave McCarthy’s Republican Party still believes is a liberal hoax. Right. Last year we had a 500-year storm and 3 separate 100-year storms all within a few months. But it’s all a hoax! As far as McCarthy bringing up the firing of Hal Alvord (God rest his soul), let’s set the record straight. Hal had a lot of good qualities that have been recognized by Harry Rilling and many others including me, , and I will forever be grateful for his help on promoting tree planting around the city and on many issues including a beautiful renovation of Cedar St in our neighborhood. He should be remembered fondly for those contributions. But let’s be honest since McCarthy brought up the subject in such a crass way. Hal also had a bad habit of deliberately misleading the public and other public officials, including the Common Council and the Mayor and other departments. This was tolerated for years until it could no longer be accepted for a public servant. Harry had to do what any responsible leader would do faced with that situation. No need to go into detail but it’s all on the record. And McCarthy also had the same bad habit, all on the record. Norwalk voters rejected him in a landslide as a result. Let it go and move on! You don’t live here anymore and nobody cares about your old axes to grind. We all know how good those records are on 500 year rain fall totals. Excuses du jour are no way to run the infrastructure of a $20 billion city. The management approach of expecting results seems to be a better one than hopeing your workers like you. There should be records of tonnage of debris from sweeping and vacuuming to support the assertions. Or you can just believe that water runs uphill now thanks to global warming. Where is Mayor Rilling’s plan to deal with the expected major impacts on the City’s Downtown from rising water levels. Surely thats more important to the City than the $75 study on vacant Manresa Island. And even more so than the Boondoggle Bridge the Mayor says he’s studied that’s opposed by virtually every City resident. Mayor Rilling could have left a Legacy of achievement by encouraging a 4 year college in the City – we’re the only City in CT w/o one – and developing a meaningful harbor flooding protection plan. Rather than focus on the Boondoggle Bridge as his Legacy. Apparently anything Mike Mushak says is permitted. I have never mentioned anything about climate change, much less denied it. A string of insults, while my comment is completely factual. Millions have been spent, but there is no evidence and no result? Mike Mushak’s comments have been, and will continue to be deleted when they cross the line, just as everyone else’s are. That said, NoN’s comment moderators are human, and do occasionally err. If anyone feels a comment has been allowed that shouldn’t have been, he or she may send an email. What is DPW up to at the intersection of East Wall St(Mill Hill) & Wall St. On Wednesday once again there were 2 big trucks that had JACOBS/City of Norwalk on the sides. There must be a major sewer problem at this spot because of the apartments – Head of the Harbor. How much money is it costing the city to be this buildings person plumber? The infrastructure cannot handle all the waste this building is producing – every other week trucks are there trying to flush that line. Didn’t anybody realize the sewer could not handle a building of that size before it was built?